Peruvian banknotes and coins, awarded many times for their beauty and security features, depict the countries diverse and rich archaeological and cultural past, historic figures and natural resources. Now the Peruvian Central Reserve Bank launched a new numismatic series featuring the “Threatened Wildlife of Peru” ("Fauna Silvestre Amenazada del Perú"). The new S/ 1 coins of the series are legal tender and are not thought to replace current S/ 1.00 coins. The coins will circulate simultaneously and can be used in any transaction. With this new numismatic series Peru aims at raising awareness for the importance of species and environment protection in the country and continues the lovely Peruvian numismatic culture. The first coin of the series that was put into circulation today features the Andean spectacled bear, also known as the Andean bear, Andean short-faced bear or tremarctos ornatus. 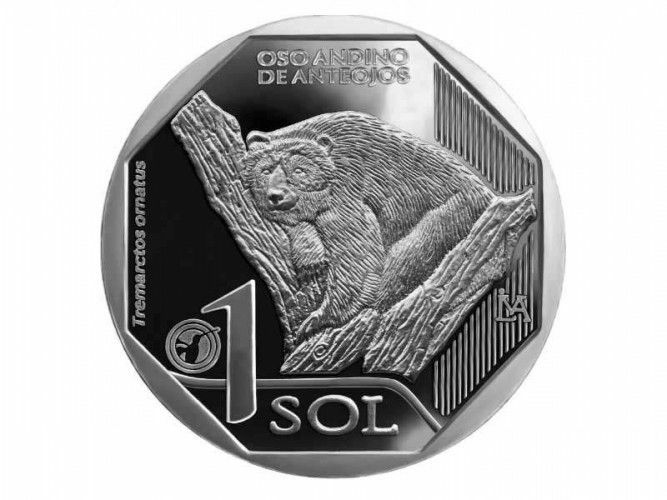 The front of the new S/ 1 coin shows a spectacled bear laying on a tree, while the back as usual features the Peruvian coat of arms. As only bear native to South America the spectacled bear mainly lives in the Andes Mountains of Ecuador, Colombia, Bolivia and Peru in humid and cooler areas such as cloud forests, high-altitude grasslands and moors. The mid-sized Andean bear which measures about 1.30m to 1.90m and weighs between 50kg and 150kg, has a blackish-brownish fur and distinctive whitish-beige to light brown spectacle-like markings around the eyes and across the face and chest. With only 18,000 spectacled bears left on our planet, from which about a third live in Peru, the Andean short-faced bear is considered vulnerable according to the IUCN (International Union for Conservation of Nature) Red List of Threatened Species. The main threat to the Andean Bear is from habitat loss, due to expansion of agriculture, grazing, mining, oil exploration and road development. With diminishing and more fragmented habitat, Andean bears increasingly raid crops and kill livestock, resulting in more retaliatory killing and illegal hunting.